Having only her third start, Ivette (5 m Jimmy Choux – No Reins, Show A Heart) won the Waharoa Transport Maiden 1400 metres on 29 August at Matamata. When resuming at her previous start, also at Matamata, Ivette had produced a game run against the rail to finish second over 1200 metres on Heavy10 footing and although a period of rain worsened track conditions to Heavy11 she coped admirably. Owned by Craig Dunn, Dave Trubshoe, Elizabeth Galbraith, Tony Nicol, Adrian Mathieson, Rob Alderson, Gary & John Eddington, and Ballymore Stables NZ, Ivette was bred by Lime Country Thoroughbreds. Ridden by Jake Bayliss, who returned on Sunday from Queensland, Ivette was patiently handled and travelled well in ninth, ranged into contention around the home turn and after quickening to lead at the 200m she displayed plenty of determination in drawing out to win comfortably. Paying $6.10 & $1.90 on the NZ TAB, Ivette ran the 1400 metres in 1:33.3 and last 600m in 40.5. “Pam (co-trainer Pam Gerard) was 50/50 whether to scratch, so took the punt and ran her,” Bayliss said. 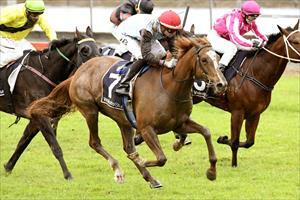 “She got through the going fine and got out wide to the best part of the track which would have helped her a lot. Bayliss made a great fist of his time last season in New Zealand. Although missing the first four months he still rode 35 winners, seven of those were stakes wins and included a Group One, with over $1 million in prize money. “She’s a wee tiger, just keeps trying and the win was quite impressive,” said Gerard, who trains in partnership with Mike Moroney. “She always had the ability but taken time. She had sore shins earlier on and thankfully the owners have been very patient and had faith in fact that we told them she could actually gallop. “I’ve always liked her and even in her trials earlier on she never did anything wrong. We couldn’t have faulted her, but she just kept going shin sore. “She settles beautifully in her races, puts her head down, does nothing wrong and can come into it when she needs to. I wanted to see her settle back and bring herself into it, which is what Jake did and it was great to see him get a winner on his first day back. Ivette was strapped by Pavin Kumar.